I’ve always enjoyed long train journeys. I like the feeling of being close to the country through which you are passing and having the leisure to observe it without having to concentrate as one does whilst driving. It’s less antiseptic and homogenous than modern air travel, where one airport could be another, and far less strenuous than cycling. Some of my favourite train journeys have been the overnighter from Moscow to Leningrad I did in 1987, the trip down the East Coast and South of the US I made a decade later and the journey I made from London to the Swedish part of the Arctic Circle I did with Mrs F on our honeymoon a few years ago. Newby, the author of many travel books, including the classic A Short Walk in the Hindu Kush, made the journey with his Slovenian wife, Wanda, in 1977. Back in those days, of course, the Soviet Union still existed and the Communist authorities tightly controlled the travel schedules of those foreigners it permitted to enter the country. The Newbys were therefore required to travel with Otto, a German photographer, and Mischa, a guide from the official Intourist travel agency, whose role was not only to help them but also to shepherd them and ensure they saw only what the authorities would want them to see. The Big Red Train Ride is a bit of a curate’s egg. On the positive side, it is an interesting historical record of the way in which foreign travellers in the Soviet Union were treated during the Communist era and also a picture of life in rural Russia at that time. There are evocative word portraits of the limited availability of food stuffs and consumer products and some amusing vignettes of bizarre official visits arranged for the Newbys and Otto by Intourist. There are also some entertaining passages detailing life on the train and, in particular, the attitudes of the female train conductors, some of whom appeared to be acting almost as guards, attempting top prevent the Newbys from getting access to the other part of the train where the travellers were Russian. 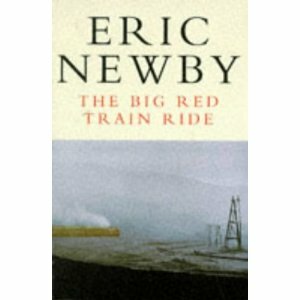 However, Newby runs into the problem that writers are almost bound to experience when writing about train journeys. Trains are, by their very nature, closed environments and make finite stops for limited periods of time. This can make for limited source material for the hopeful author. Writers such as Paul Theroux gets round this problem either by using a number of train journeys in their books (The Great Railway Bazaar, Riding the Iron Rooster) or by making extended stops along the way (The Old Patagonian Express). Unfortunately for Newby, he has neither of these opportunities. The Trans-Siberian is a single train for the length of its journey, with the same passengers for most of the way and, at the time he weas writing, he was only allowed to alight at certain specified stations and then only for eh amount of time Intourist would let him. It may be that a Paul Theroux could still have made something of this, especially in light of the wonderful descriptions of his travelling companions on the Orient Express in The Great Railway Bazaar but, to be honest, I don’t think Newby is in the same league as Theroux as a writer and, in any event, he was pretty much restricted to being with his wife, Otto and Mischa for much of the journey and there is only so much one can do with such a limited cast. What this means, though, is that Newby has to pad the book out somewhat with potted histories of not only places he visits but also places the train just happens to be passing and, although some of the information is interesting, there is is just too much of it for a travel book. Overall, this is a patchy book, worth reading if you are interested in Russia, train travel or the Trans-Siberian itself but eminently skippable if you are not. Booking Buddy is the most popular travel booking search website, where you can compare travel deals from all the top travel booking sites. Top Ten Tuesday: Happy Thanksgiving, y'all! Top Ten Tuesday: What's Hiding In The Pile?